Available in Northern Ireland, Hyundai Motor Uk's revolutionary Click To Buy website is now live. Customers nationwide can now purchase a new car completely online using the user-friendly website. The customer-friendly, no-haggle, fixed-price experience makes buying a brand-new Hyundai simple, quick and transparent. Click To Buy is a website which makes the process of buying a new car simple and transparent, with a user-friendly, no-haggle shopping experience. Customers can research and buy a new Hyundai for a fixed price at a time that suits them - either from the comfort of their own home or when they’re on the go using their smart phone, tablet, laptop or home computer. The entire process is possible to complete in less than five minutes when purchasing with cash, making it just as easy to buy a new car as it is to buy a weekly grocery shop online. Currently, the Hyundai i10, i20, i30, Tucson and Santa Fe are available to purchase through the Click To Buy site at competitive fixed pricing. When customers visit Click To Buy, they’ll be able to get a trade-in price for their current car, use trade-in funds towards the new car purchase, configure their new car, add accessories and service plans, arrange finance and pay a deposit. Configurations and finance valuations can also be saved for up to 14 days and returned back to at a later stage if the you need time to think about your decision. 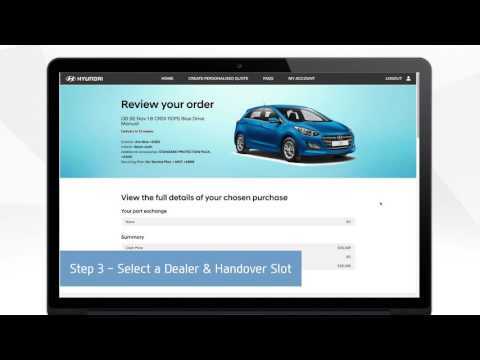 The purchase is then completed online and customers buying with cash can either select their preferred handover slot at a dealership of their choice, or they can choose their preferred slot for home delivery. Home delivery is also available to customers buying through finance, although finance paperwork will need to be signed beforehand at a local dealership. Trade-in cars can either be taken to the dealership on the selected handover date, or will be collected from the customer if home delivery has been chosen. For added flexibility, those purchasing through Click To Buy in Northern Ireland can also choose to collect their new car in the evening and at weekends from Saltmarine Hyundai. Further models and greater functionality will be added to the Click To Buy website later in the year.